The cold weather is finally gone and Cinco de Mayo is around the corner! Who doesnt like a festive day full of margaritas, tacos, burritos, and beer? This is a day to remember and honor those who were a part of the great Mexican defeat over France in 1892. Gather your friends together and celebrate in style this year at the Official Arlington Cinco de Mayo bar crawl! Arlington is home to over 230,000 people so you already know this Cinco De Mayo celebration is going to be wild! Hundreds, maybe even thousands of crawlers will swarm the streets and fill the cities best bars. 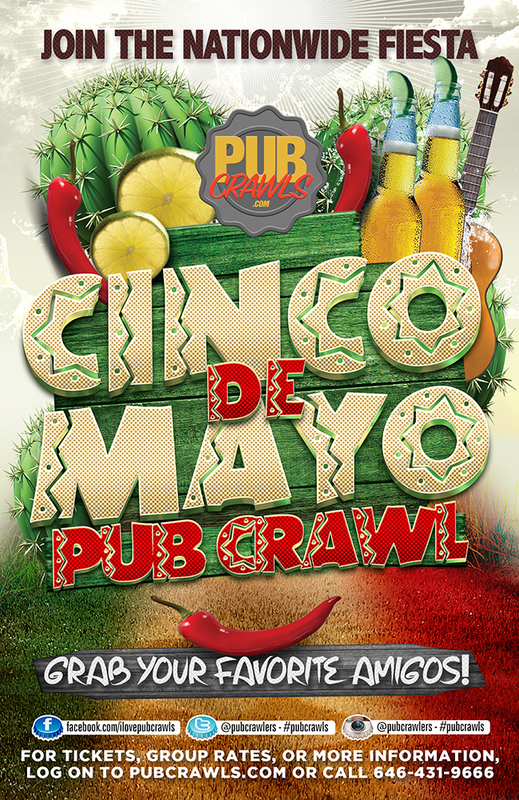 PubCrawls.com is bringing Arlington a Cinco de Mayo Pub Crawl they have never seen before, and this will be the event that kicks off the summer the right way! Guests will start by checking in at the registration venue where you will receive your all access wristbands. Guests will also receive a full guided pub crawl map to follow that will include all of the best drink specials and venues throughout Arlington. It is really that easy! Lets all channel our inner Mexicano for the day by drinking tequila and eating tacos all day with our best buds! May 5th is approaching and we hope to see many of you rockin your fake mustaches and sombreros through the streets of Arlington. This Cinco De Mayo is going to be one you will never forget! Get your tickets now as prices will increase as we get closer to May 5th!